You probably know the drill by now, dear reader. It is the first of the month, so I am discarding book 7 like an old belt with no buckle and beginning afresh on book 8, my Sci-Fi opus. I was provocatively poor at science in school, sitting Standard Grade Physics and Chemistry for no real reason that I can recall (I think most of my friends were doing it) and wishing later that I’d done Biology instead because at that level it seemed to involve a lot of writing, something I am good at, as opposed to learning equations, something I am bad at. For this reason you will not be getting a hard sci fi book out of me, because any attempts to be technical will be about as convincing as John Yates in front of the Select Committee. Furthermore I have the eternal lack of research problem, which always makes avoiding cliches a challenge. Still, I haven’t let it stop me any other month and I shall persevere this time too. 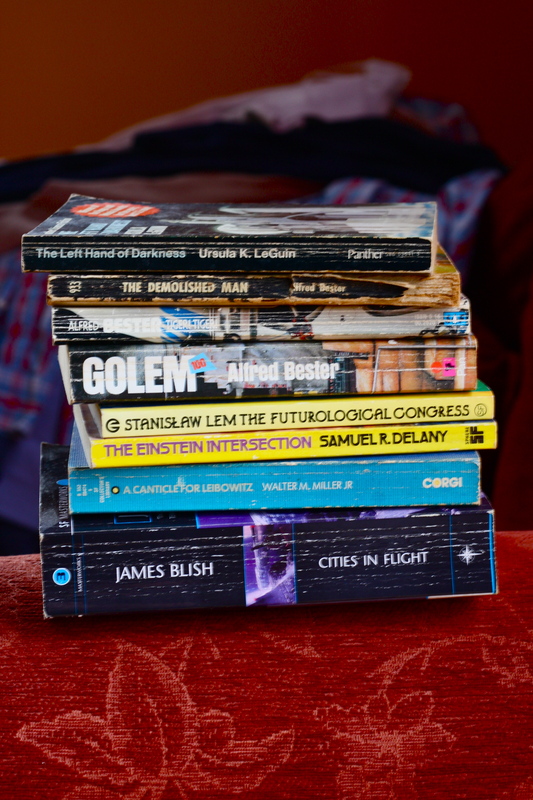 Most of the science fiction I’ve read is YA (that stands for Young Adult, for those who dislike acronyms) or Graphic Novels, so my dad has given me a small pile of classics to look at, which you will see on the left of the page. I am only working at my temp job three days a week in August, so maybe I’ll be able to get through them – except of course August in Edinburgh means the Fringe and the Book Festival and all kinds of other distractions, so I can’t make any promises on that front. I do hope to see a few proper writers talking about interesting stuff and things though, so will branch out a bit in terms of blog content for a few weeks by talking about someone other than myself. But I’m getting ahead of myself – none of that has kicked off yet. So for the moment, my thoughts on book 8. I’ve had more reading recommendations for this genre than any other, which is mildly disconcerting. It could just be because a lot of the people I know are slightly geeky and have a natural predilection for sci-fi – but what if it’s actually because nobody trusts me to write it?! Maybe they’re listing tons of stuff to read so I never get time to write anything, as my ham fisted attempts would surely ruin it for all of mankind. I appreciate/hope that’s probably not the case, but I think the ‘what if..?’ is a useful thing to ponder over the next 31 days. What if cars were sentient, and slightly schizophrenic? What if I fell in the fridge at work and went through a wormhole into a parallel reality? What if a terrible virus turned everyone into wasps? I plan to go for the slightly more realistic what if, though, because my main interest lies in the future dystopia – the ‘what if at some point in the future, all disease is cured and nobody can die?’ sort of scenario. Although it could make me a paranoid wreck by the end of the month. To counteract that panicky feeling that everything is about to explode or melt or otherwise go wrong as a logical conclusion to any given ‘what if..?’; I plan to break with tradition by writing an outline for this book. I may even do some chapter planning! I know, it’s crazy. What’ll I do next, etc. This is partly because I have the beginnings of an idea which I think might actually be pretty good, but I don’t want to explain it till I’ve worked out how to do it justice. At which point it might turn out to be so good I still don’t tell you – what if you steal it? But if it turns out to be average, I guess I’ll let you have a peek. Your dad’s books are good, but there’s always a problem just reading classics. You wouldn’t read Wordsworth and think it representative of contemporary poetry.